Still lots of question as to whether anything will come of it. But I drew a circle where I see a glimmer of hope. » a circle where I see a glimmer of hope. It looks like the ecm has regenerated a little more, the wound seems as flat as the scalp tissues now. Also I swear the left is looking like it is going to be scar free soon. 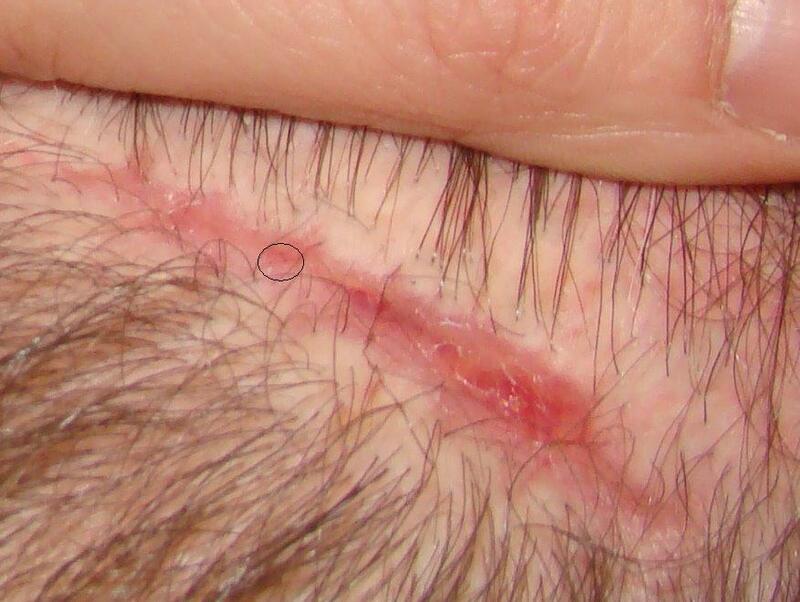 However I’m still worried about the wound being contaminated by fibrin scabs, with fibrin known to transform ECM to bring scar maybe affecting hair growth. Just hope the right side will catch up to the left side. Given the situation of the original wound, I think that result is pretty awesome. But I see no reason to get excited about follicle regeneration here yet. A few dots do not a follicle make. » But I see no reason to get excited about follicle regeneration here yet. » A few dots do not a follicle make. » » a circle where I see a glimmer of hope. » going to be scar free soon. » Just hope the right side will catch up to the left side. The wound is healing nice…really impressive. I think it’s too early to look for hair. I’m worried about a few things, including the wound being contaiminated by fibrin. It seems that they are reading this forum and following our advice. Another person has helped the trialist to put the hair aside in order to take the close-up photo. Its great that the hair has not been trimmed, because this way, the potential new hairs will be distinguished from the old ones. The wound is healing very well, and the “pit” has already been filled very well with new tissue. There is no doubt that there is new tissue in the gap, i.e., the healing is not just by contraction of the boundaries. As I am no expert in this, I don’t know if this new tissue is completely normal or it is more scar-like tissue. shouldn’t there be a 2nd application of acell power as well? and i’m also nut sure if it would work better if you’d use it on a work FRESH wound (in that case he openend an old scar). » shouldn’t there be a 2nd application of acell power as well? » FRESH wound (in that case he openend an old scar). He cut into the skin and removed the scar tissue. That makes it a FRESH wound, completely free of scar tissue. keep in mind that the test patient seems to have fairly low density in the back to begin with. if he grew 10 follicles, given the size of the wound, that might be full density. » » shouldn’t there be a 2nd application of acell power as well? Based on their vet models, it seems so, but the doc worked with ACELL and followed their protocol, so nobody here really knows if a 2nd application was required. » » FRESH wound (in that case he openend an old scar). In this case, you are just plain ignorant, but…WE ALL AGREE!..on that. It is a FRESH wound, there is no scar tissue. Tell me maneless, what is the difference between making an incision in scarless tissue and making an incision around scar tissue and removing it? The end result is the same, a FRESH open wound with no scar tissue. What makes it different? Nothing. It is the same thing. But I’m sure you will still object and provide no valid reasoning.